The Interspiritual Traveler : What About Sentient Beings That Transmit Disease? 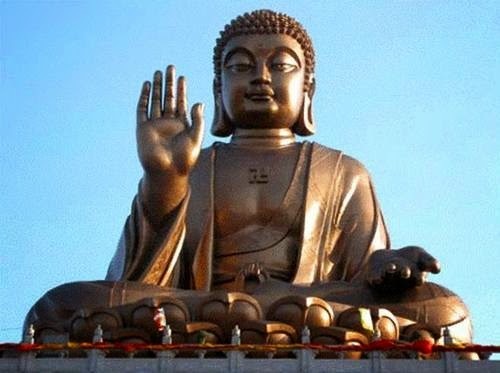 Many Buddhists say that, for them, part of the appeal of the Buddha's teachings lies in the truth that he encouraged people not to accept the teachings with blind faith but rather to test them, to check them out, to be sure that his teachings rang true for the individual believer before that person accepted them as a matter of faith. That is true for me as a Buddhist Christian as well. In fact, I have taken that same principle and applied it to the teachings of every spiritual teacher I have encountered, both those of history and those who live in the present day. One of the things we have learned from the quest for the historical Jesus is that if we are going to understand a teacher accurately, we need to understand his or her historical and cultural context. In other words, we cannot interpret the teachings of someone who lived more than two thousand years ago as if they were living and writing in twenty-first century America if we want to understand them accurately. For example, we can't understand Jesus' criticism of the Pharisees unless we understand who the first century Pharisees really were. Similarly, we can't understand the Buddha's criticism of Hinduism and the Brahmans of twenty-five hundred years ago unless we understand something about who those people were. No matter our religious tradition, one of the challenges in interpreting the teachings of the great historical teachers is the truth that they taught in a prescientific era while we live in a scientific era. We simply don't know what either Jesus or the Buddha would have said about contemporary medical procedures such as blood transfusions, yet we have ample evidence of what most people see as unwise conclusions that can be drawn when we fail to understand these teachers in their historical context. To say that either Jesus or the Buddha would want a young child to die rather than have a blood transfusion is at best simplistic and foolish. At worst, it represents a wanton disrespect for life and failure to fulfill parental responsibilities. What are we to make of the teachings of the Buddha which prohibit taking the life of any sentient being, presumably even those that carry disease? These teachings were made at a time in history when next to nothing was understood about disease vectors, the illness process, or how to protect oneself from what today constitutes an avoidable health crisis. 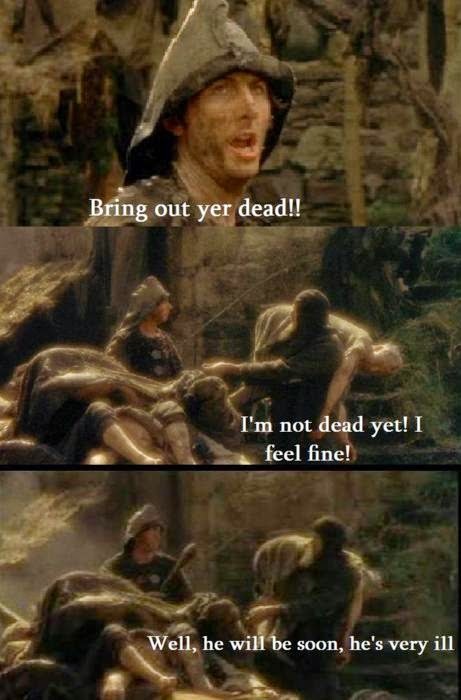 As an example, consider the black plague in the Middle Ages. 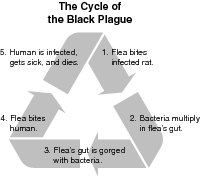 The plague was transmitted by fleas and rats, and both are sentient beings. Presumably one of the reasons that plagues no longer afflict us is that society has learned the importance of pest control. Had the Buddha understood the role of certain sentient beings as disease vectors would he have granted an exception to the prohibition against killing sentient beings, or would he have said that the victims of the black plague were merely the victims of their own karma? Is it compassionate to allow human beings to die when we have the technology to avoid those deaths simply because to do so we must kill other sentient beings? I do not believe it is, but more importantly because the Buddha encouraged us to test his teachings for ourselves and see if they are true, he himself offered us the latitude to make decisions like this. To cite another example, what about the role of mosquitoes in the transmission of malaria? Are we to simply allow mosquito populations to proliferate in areas where malaria is prevalent, or are we to take action to eliminate mosquito breeding grounds and even the mosquitoes themselves? Was it the Buddha's intent that human beings should suffer and perhaps even die needlessly, or would he say that the more compassionate act, and in fact even an act that would have a positive impact on the karmic debt of the disease vector, would be to kill the disease vector? Are we to stumble along ignoring the knowledge that science has given us in the name of a literal interpretation of a twenty-five hundred-year-old teaching that the teacher himself said we should examine before accepting? This is perhaps one of the places where we might see a kind of Buddhist fundamentalism coming into view. 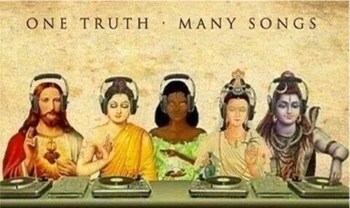 The truth is that every teaching of any historical spiritual or religious figure is by very definition time bound. Our job as spiritual people is to continually reinterpret those teachings for a new era in light of advances in knowledge as time goes by. We must of course be sure that we are not reinterpreting those teachings simply for our own convenience. We must limit our reinterpretation to those areas in which our understanding of the world has advanced beyond the understanding of the teacher's time in history. There will always be those who say this isn't permissible, but if you examine their own lives you will see that they do things like drive cars, take antibiotics, have a refrigerator in their kitchen, and scores of other things never expressly permitted by the historical teacher they follow. Healthy spirituality never asks us to check our brain at the door. Most importantly of all, rules are never more important than people. There is no spiritual benefit to be found in sacrificing our own lives for the life of a flea, mosquito, or rodent and no healthy spirituality would suggest that such a benefit exists. Common sense is indeed part of a healthy spirituality! 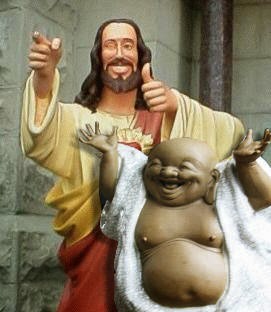 There is no such thing as a Buddhist-Christian. Oh, I assure you, I am quite real.